Our mission is to help low income Craft Producers in Developing Nations market their crafts in the United States. We fulfill this mission now by purchasing these crafts directly from the people who make them and retailing them to you in our webstores on Amazon, Etsy and eBay, and at local shows. To email us just use the Contact From in the drop down menue from the About Us button above. Gary Bond is a past member of the Board of Directors of the Fair Trade Federation, Jan Merrill is a past Board Member and Treasurer of the Fair Trade Federation.They started the company that would one day become Global Marketplace after organizing several fund-raisers selling gift packages of coffee from theThanksgiving Coffee Company. The Thanksgiving Coffee Company works with small coffee growers in Central America. Gary and Jan heard about Thanksgiving Coffee at a Democratic Party event, where the organizer took orders for the coffee and shipped the coffee later. When a fund-raiser for the Peace Center in Palo Alto, California, came up, Gary and Jan bought $500 of Thanksgiving Coffee up front, and sold the 1-pound gift bags at a Holiday Fair in December, 1987. All the coffee sold in two days, and the idea of retailing items over the counter was born. In December, 1990, Gary and Jan organized a fund-raiser at their church, and sold Thanksgiving Coffee, crafts from Pueblo-to-People, and Earth Care notecards and gift wrap made from recycled paper. Many customers told them how much they appreciated the idea that their purchases were helping not only the church, but the craftspeople in Central America and the environment. It was after this fund-raiser that Gary realized there was enough consumer demand for socially-responsible products for him to build a retail business. To test this idea, Gary rented a space at the largest local flea market at De Anza College in Cupertino, California, in April, 1991, and successfully sold crafts and recycled paper products. The retail business was launched! Gary and Jan did more flea markets and special events in 1991 and finished the year with a Holiday store within the local Sears department store. This proved so successful that in March, 1992, Gary registered the name Global Village (now know as Global Marketplace) and opened a small retail store in Los Altos, California. After Gary realized the store was in the wrong location for walk-by traffic, he moved the business to a popular shopping center, Vallco Fashion Park in Cupertino, California, for the Holiday season in 1993. In April 1994, Gary hired staff from local colleges and opened a full-time cart at Vallco. 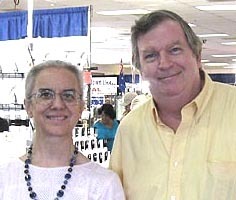 In April, 1996, Gary and Carol Horner opened a 1000-square foot retail store (Global Village) there. The store did very well until the decline of the shopping center reduced the foot traffic so much that sales declined sharply. The store was closed in December 1998. After a small trial of a cart at Valley Fair Shopping Center, Gary realized the Web was where the future of retailing fair trade crafts was and after closing the cart opened an online store in Yahoo Shopping in the Spring of 1999. By the end of 1999 online sales were so good that the decision was made to make this the new home of Global Marketplace. The main reason Gary and Jan are retailing crafts is to help artists, their families, and villagers in developing nations make a better living. They have learned that it takes more than just retailing the crafts for this to happen. It takes changes in consumer, business, and government policy to really raise people above the poverty line. For this reason they announced in 1999 the creation of﻿ Global Marketplace.